Conservative radio personality Rush Limbaugh was taken to the hospital earlier today after suffering chest pains in Hawaii. Responding to a 911 call from the Kahala Hotel and Resort where Rush Limbaugh has been staying, paramedics took the controversial radio show host to Queen’s Medical Center, where he is reportedly listed in critical condition. TMZ says sources inside the hotel tell them the hotel took drastic measures to hide the fact that it was Rush Limbaugh who was being removed. The sources say hotel security closed off a wing of the hotel as well as the guest elevators, and used the employee elevator bank to get Limbaugh out. Rush Limbaugh reportedly told the medics he is taking medication for back problems; it is unknown if said medications are related to Rush Limbaugh’s current condition. 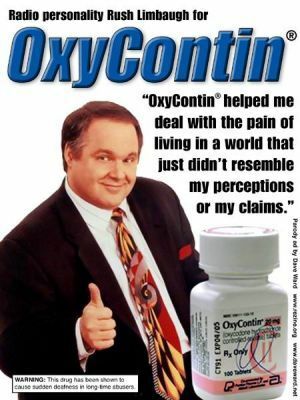 Rush Limbaugh is no stranger to issues with pain medication. Back in 2003, the then most-listened-to radio host announced on his show that he was addicted to painkillers; he then entered rehab. With an investigation by drug agents in Florida hanging over him, the conservative commentator said it was time to deal with it. “Immediately following this broadcast I will check myself into a treatment center for the next 30 days to once and for all break the hold that this highly addictive medication has on me,” Limbaugh said. This ad is too cute! Can’t compete with it. Just want to say excessive ambition and greed leads to heart attacks. Recently on t.v. Rush stated: “I only want to get richer and make more money.” Selfish ambition like this puts excessive strain on the heart. So give it up and get well. You need to meditate to the real God, Rush. Sorry, but that real God is not YOU! 53 queries in 0.635 seconds.